Jai Shri Ram," shrieked the betel-chewing spectator, and sprayed the kurta of the man in front. Just four days before Polling Day, for the Bharatiya Janata Party's supporters in Itarsi, Madhya Pradesh, Atal Bihari Vajpayee's rally on Wednesday afternoon was the grand finale. It was a well timed boost for BJP candidate Sartaj Singh, and the party's powerful response to Sonia Gandhi's rally in neighbouring Pipariya two days earlier. "Whichever area Sonia Gandhi covers, Atal Bihari quickly follows to cover lost ground, if any," observed a Hoshangabad resident earlier in the day. Enroute from Jhabua, Vajpayee was two hours behind schedule. Until he arrived, the BJP's newly acquired Aslam Sher Khan and local leader Dushyant Gaur dominated the stage with their anti-Congress spiel. It was Gaur's anti-Sonia stance which the crowd found most entertaining. Gaur said though he had no problem in accepting her as the nation's bahu, he had serious reservations about her lifestyle, even the kind of toilet she used. "While the daughters of this soil wake up and pray to the sun god, she first slips her feet into Italian slippers. While our women go to the forest to answer nature's call, she uses a commode made of Italian marble..."
But there was more entertaining stuff ahead. "Like soap companies use pictures of Madhuri Dixit to boost sales, the Congress is using Sonia's picture to boost theirs..."
The crowd lapped it all up. The betel-chewing man slapped his stained kurta neighbour's back in enthusiastic agreement. By then the helicopter was spotted. The crowd sprung into action again. Atal Bihari Vajpayee quickly went through the ritual of garlands and got to business. It was a complimentary beginning, welcoming the BJP's newfound ex-Congress leaders -- Aslam Sher Khan and Dalip Singh Bhuria, whose constituency Jhabua he had visited earlier in the day. 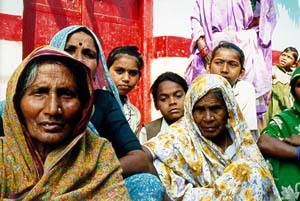 Highlighting the police firing which killed 17 farmers in Multai, Betul, last month, Vajpayee said, "the Congress has forgotten to serve its people, and that will be the cause of its defeat." 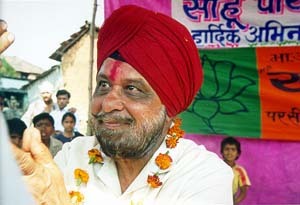 He attacked Congress policies in Jammu and Kashmir and Punjab and predicted that the party would lose in MP as well this time. Urging the 35,000 strong crowd to support the BJP, he said the last time their attempt had failed because every other party had closed their doors, windows even their ventilators on the BJP. The crowd loved that one too. "People say they will not let us get to Delhi, but we are already in Delhi -- how far is New Delhi from Delhi?" he asked the crowds with appropriate Vajpayeesque drama. Rising prices, corruption, the disintegration of the Janata Dal, the fodder scam and Bofors were some of the other issues he quickly covered in his 30 minute speech. "The Congress is shying away from Bofors," thundered the man whom that party's star campaigner had called a liar last week. Then, he moved to Laloo Prasad Yadav and went on to give the by now familiar example of a cow in a magistrate's court. "The cow went to the court for anticipatory bail, because she said she also ate fodder." Returning to the Congress, he said the party was on an apologising streak and asked why it should be forgiven. 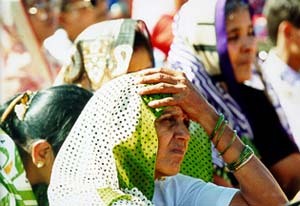 After all, he said, the Congress had not yet apologised for the massacre of Sikhs in November 1984. 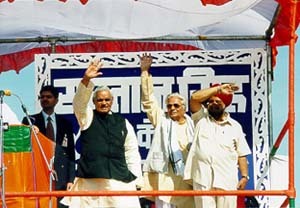 Vajpayee promised the crowd 10 million jobs and 2 million homes. "Give us a chance," he told the voters of Itarsi. "You have given them 50 years, all I ask for is 5." The crowd clapped, roared, jumped, stood on their chairs. Atal Bihari Vajpayee had struck a chord once again.